Good, If we demolish everything old or all the stuff we don’t like you just end up with something like Bowden that is almost completely devoid of any record of the past history of the area. I agree with your sentiment, but not sure about using Bowden as your example as there is much that has/is being retained. The Harbours Building development is a breath of fresh air. Finally a developer that wants to maintain and celebrate a buildings original features. Can't wait to see the 1970's inspired interior. I love this era and have always said it never goes out of a fashion. I'm not the biggest fan of brutalism, but this hotel is a great idea. If done well it could become one of the more interesting hotels in the country, and I imagine many fans of unique architecture will travel just to stay in it. I'm more interested to see what they do with the exterior then the interior. The interior will be fine, it's a hotel, they'd have to try really hard to screw that up. I think the point is that the exterior won't be changed (not to say it might not need some restoration work and a clean). Perhaps they'll remove some of the rooftop structures but I presume the rest will stay largely as is. This is so disappointing. It was such a coup to get the City of Adelaide here, and it could be such a saleable attraction to the heritage of the Port, but the government is content to just put it out of sight and out of mind and let it return to rotting. IMO the vacant site at the corner of McLaren Parade & Lipson Street (adjacent to Lighthouse square) should be acquired and turned into an aquarium/maritime attraction. Hopes of securing the future of two of South Australia's most iconic wooden boats are sinking, with one facing certain demolition and the other effectively adrift. 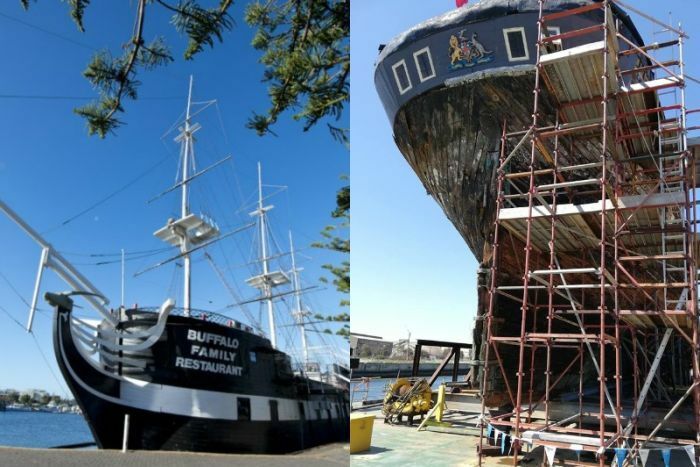 The world's oldest clipper ship, the City of Adelaide, is fast approaching a deadline to move from a Port Adelaide development site. But the well-known Buffalo at Glenelg in Adelaide's west is facing an even more definite fate, and will be reduced to rubble next week. The HMS Buffalo replica, which was built in 1980 and operated as a restaurant, fell into disrepair in recent years. While not a real boat, it has long sat in shallow waters alongside the Patawalonga River, and its design imitates the ship which brought the first batch of European settlers to South Australia in 1836. 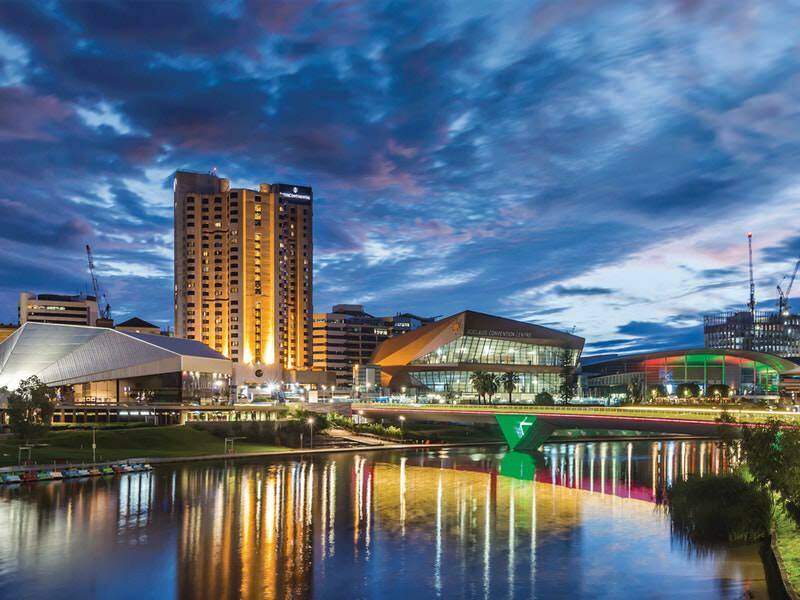 In 2017, the council approved an application by an Adelaide businessman for a $1 million redevelopment of the Buffalo. Despite those plans, the City of Holdfast Bay has approved an application for its demolition. City of Holdfast Bay Mayor Amanda Wilson told the ABC she believed the final cost would have been higher. "The further he got into the development process he realised that it was going to be much more expensive than envisaged," Ms Wilson said. She said the Buffalo's appeal to diners had also diminished. "Looking at the way people go out these days it's not the same as what was happening in the 80s," she said. "The Buffalo was very much a novelty dining experience in the 80s and it was before we had the Holdfast Marina, the pier, the alfresco dining in Moseley Square, so people's tastes have changed." Meanwhile, South Australian Transport Minister Stephan Knoll has given the owners of the 155-year-old City of Adelaide until March to move it from Dock One to another part of the harbour known as "Dock 2" in Port Adelaide. It is situated on the northern side of the Tom 'Diver' Derrick Bridge over the Port River and is difficult to access from the historic part of Port Adelaide. However, City of Adelaide Preservation Trust director Peter Christopher would rather the ship be moved to a regional city or interstate than to such an "inaccessible" location. The group led a 14-year campaign to get the ship's hull returned to Port Adelaide before it was placed on a barge at Dock One in 2014, where it has remained ever since. The ship brought thousands of migrants to South Australia in the 19th century but was left to rot on the banks of a Scottish river for decades. Starfish Developments wants the ship moved before it starts promoting 750 home sites for sale next to Dock One in February. Managing director Damon Nagel told the ABC more than 400 jobs were at stake. He said the State Government sold his company the Dock One land with the understanding the City of Adelaide would be moved "months ago". "You could argue Port Adelaide isn't actually the greatest suburb in Adelaide and it needs development to get going and this ship is single-handedly stopping it," Mr Nagel said. "People… buy down there because they want a view of the water and the other side of Dock One. "It's just not appropriate for a ship of that size to be in that residential environment." He said the ship and related "paraphernalia" on the dock were at "ground zero" of the development, stopping initial works for stormwater, sewerage and power going ahead. "The trust owners I think are being difficult in the sense they've got an unbelievable offer from the Government," he said. Earlier this month, Mr Knoll said the land at "Dock 2" was the only site the Government had to give away in Port Adelaide. Mr Knoll gave Mr Christopher's group a March deadline to move the ship during meetings on December 21, 2018, and on January 4 this year. "All the other parts of the inner harbour have been sold off by the former government for housing development, so we're working with them to identify what bits of land we have," Mr Knoll said. "But we can't compulsorily acquire someone else's land to stick the ship on so we have to work on the opportunities we have available." Mr Christopher said the clipper could move to the offered site in the long-term, "subject to a number of conditions, including a road being put in so people could find it". "Dock 2 is virtually inaccessible," Mr Christopher told ABC Radio Adelaide today. "It's an industrial wasteland. Nobody could find it even if they had a map to show them there. "So if the ship were to go there in a temporary situation, it would just be lost." He said the trust was against being forcibly moved by March, and said the Government had shown a "lack of interest" in the historic boat. Port Augusta in SA's north has previously expressed interest in the vessel. Aquariums don't make money. I've said it before, move the clipper onto dry land and inside the market shed, build a new maritime museum around it... This then puts the lighthouse even closer to the museum. Well said Patrick_27. I’ve long dreamed of the Maritime Museum taking over Shed 1 (Fisherman’s Wharf) as well as the Customs House, Institute Building, Telegraph Station (currently empty pigeon toilets), and the vacant dock space next to the lighthouse, and building a massive state of the art maritime museum precinct right at the end of Port Road, with hundreds of metres of dock space for the C of Adelaide, Failie, Yelta, Archie Badenoch and One and All, in a row, and raising the lighthouse up on a podium to make it a true landmark. And light it spectacularly (instead of the present dim effort). Sadly successive governments have been pathetic and vision-free with the Port, and have firstly sold off our heritage, then allowed the buyers to run it down, then acted on behalf of the developers in shunting our heritage away down the river. The current mob seem to a have it in for the Port too....cutting bus services, de-funding the Failie and the One and All, and now trying a disappearing trick on the C of Adelaide. Also still no info on the Port Dock spur line status...still “in design”after 18 months, and zero response to requests for a progress report. As for Shed 26?....our community is now fighting for its life after the developer suddenly decided it was all too hard to keep it. I agree with all said except with the Shed 26 point. There are costings of $10m to remove asbestos/restore the shed etc and the developer has stopped and is open to community proposals etc ie put up the money and we will keep it and/or show us how it can be viable. Its now a case of those that are wanting to keep it to raise the funds ie ask council/govt etc. With the Buffalo its amusing once its gone it will leave an old red rattler tram suiting a prime waterfront location, not. Heritage advocates have slammed a developer’s decision to knock down an historic boat shed in Port Adelaide, arguing the building is structurally sound and could be repurposed into a site similar to Plant 4 or Tonsley. Perth-based developer Cedar Woods has confirmed to InDaily that the historic waterfront shed – known as Shed 26 or “Sawtooth Shed” – will be knocked down after studies commissioned by the company found re-purposing the building was “unviable” due to its dilapidated condition. Renewal SA sold off a large swathe of land in Port Adelaide to Cedar Woods this year to facilitate the development of new residential precincts “North West” and “Fletcher’s Slip”. Shed 26 is located on the “Fletcher’s Slip” site. A spokesperson for Cedar Woods said in a statement to InDaily that while the company would retain State heritage-listed buildings on the Fletcher’s Strip site, Shed 26 was not a listed building. The spokesperson did not say when the building would be demolished. “The studies show that re-use of the building is unviable due to the dilapidated condition of the building which is largely a result of the building’s unsuitable original foundations,” the spokesperson said. But a Port Adelaide architect has told InDaily the building could be repurposed into a cultural, commercial or residential site. Mulloway Studio partner Anthony Coupe said while the brickwork in the circa-1950 building was “light-weight” and “crappy”, the building’s steel framework was “very robust” and could be retained. “The building’s presence and size are the qualities which really give it its significance,” Coupe said. “We could put a whole range of activities on the site – offices, commercial stuff, cultural stuff for example. Coupe has published a series of mock-up designs for what Shed 26 could look like if it was repurposed. He said while the building’s internal space would have to be re-configured, the steel frame could be preserved. “We realise that it could be considered a rather lumpy and inelegant structure in some ways but the internal spaces are fantastic and its presence important in the urban legibility,” he said. A mock-up design of Shed 26 featuring a floating pontoon. Image: Mulloway Studio. A spokesperson for Renewal SA said the government agency had engaged Cedar Woods and design consultants to investigate if Shed 26 could be reused or repurposed. According to the spokesperson, the work involved in bringing the building up to a standard to meet current code requirements would cost an estimated $8 million. Port Adelaide National Trust founding member Tony Kearney said he had been fighting for years for Port Adelaide’s historic boat sheds to be saved from demolition. He described Shed 26 as a “beautiful structure” with “lots of potential” to be repurposed. “You’ve got this beautiful structure, which, yes, it has asbestos, but the asbestos has to be taken off for demolition and it has to be taken off for renovation – so that’s just a given cost,” he said. Kearney criticised the State Government’s handling of the site, saying it had not put enough protections in place to prevent the demolition of culturally significant buildings on the development site. “It [the building] has just got so much potential, but it’s been completely ignored by the Government,” he said. Vitalstatistix director Emma Webb, whose arts organisation is based in Port Adelaide, said the decision to demolish Shed 26 was “crazy”. “It should be compulsory for heritage buildings to be included in plans – whether they’re listed or not – and for developers to take seriously the consultations that have been going on for years with people in the community who have wanted buildings [such as Shed 26] to remain,” she said. “We had really significant boat yards taken away along Jenkins Street in 2009 – a whole road of boat sheds just destroyed to make way for new developments. InDaily contacted Planning Minister Stephan Knoll’s office for comment but was redirected to Renewal SA. Renewal SA said with all developments it “extensively assessed the options for retaining existing vacant buildings for adaptive reuse, including the urban renewal potential within the planning and heritage guidelines”. “All existing state-heritage-listed buildings in Port Adelaide will be retained, restored and adapted for future use and enjoyment,” a spokesperson said. The historic Shed 26 at Fletcher’s Slip in Port Adelaide — which was slated to be demolished for housing — could be saved after the developer backflipped on the plan. Development firm Cedar Woods last week said it would meet with the National Trust and SA Heritage Council to investigate how it could retain the shed in its housing estate. It followed a concerted public campaign to save the sawtooth boatshed — the last of its kind left on the banks of the Port River — which culminated in the Heritage Council awarding it interim state heritage listing last month. In a letter to local activist Dave Kirner, Cedar Woods development director Mark Pivovaroff said due to “community interest” in the shed, it would “consider potential ways to retain the shed and discuss if there’s a viable way to fund the shed’s retention”. The firm had previously asserted it would not be possible to keep the shed without $8.5 million in State Government funding to remediate the building. Mr Kirner welcomed the change of tack from Cedar Woods. “It’s important that the heritage features of the waterfront are retained including preserving and restoring Shed 26,” Mr Kirner said. Former Port of Adelaide National Trust chair Tony Kearney said it was “great” Cedar Woods had begun communicating with the community and was in the process of organising a meeting with the developer. He expected it would happen after the company had spoken to the National Trust and Heritage Council. “I suspect they’re just wanting to find out what the process is and why it was provisionally listed and that’s fair enough,” Mr Kearney said. “They’ve said they will look at the possibility (of retaining the shed) … but at the end of the day they might say it’s not viable. Cedar Woods chief operating officer Patrick Archer said the firm had taken the community response “seriously” and was happy to meet with any group that had ideas to retain the shed. “It’s a lot of money to retain, but there is community interest so it would be remiss of us to not give it another go,” Mr Archer said. However, he could not guarantee a solution would be found and would not be drawn on whether Cedar Woods would be willing to fund the remediation itself. Shed 26 was one of many boatsheds that once stood in the Glaville Dockyards, owned by the government’s Harbours Board. It is one of the last remaining artefacts of the working harbour. Cedar Woods intends to build about 500 homes — a mix of two- and three-storey townhouses and low-rise apartments — alongside public parks in a major transformation of the site aimed at young families and couples. DEVELOPMENT The first stage of the new $45 million Port Adelaide Plaza shopping centre – the biggest retail development in the Port in four decades – is set to open soon with new restaurants and cafes. The first stage of the new $45 million Port Adelaide Plaza shopping centre is set to open in April with six restaurants. Precision Group – which owns the centre – last week confirmed it had already signed on three restaurants to join a new outdoor dining precinct on the eastern side of the building and was in talks with other outfits. The Funk Coffee franchise, Yiros Central and Shanghai Teahouse, which has a popular restaurant at Burnside Village, were set to be part of the centre’s first stage. The three remaining vacancies are expected to be filled with Asian or burger-style restaurants. All this food-inspired action is aimed predominantly at nearby office workers – many of whom recently moved to the Port as part of a public service relocation – who want a quick lunch. It also offers after-work dining, with licensed restaurants open until about 9pm. Shanghai Teahouse will sell its own Chinese teas and focus on light foods such as dumplings, while Funk Coffee plans on operating as a cafe. Yiros Central is a local business that already has outlets at the Brickworks and in the city. Precision Group spokeswoman Alisha Daniels expects the shopping centre – previously named Port Canal – will cash in on a recent resurgence of restaurants and bars in Port Adelaide. Artist impression of the new Port Adelaide Plaza shopping centre. Photo: Supplied by Precision Group. “The Port Adelaide demographic is growing day by day with all the residential developments taking place and with Techport workers and office workers,” Ms Daniels says. Work on the new shopping centre began late last year and is running to schedule. At the project’s completion, the shopping centre’s footprint will have grown by more than a third – expanding from 19,000sq m to just under 30,000sq m.
The number of shops will grow from 28 to 60. They will include an Aldi supermarket, a childcare centre, medical centre, bank and Australia Post, as well as 1000 free parking spaces. It is the most significant retail development in Port Adelaide in four decades.